Shredded Chicken Recipes - Many easy dinner ideas! This is a collection of Shredded Chicken Recipes. 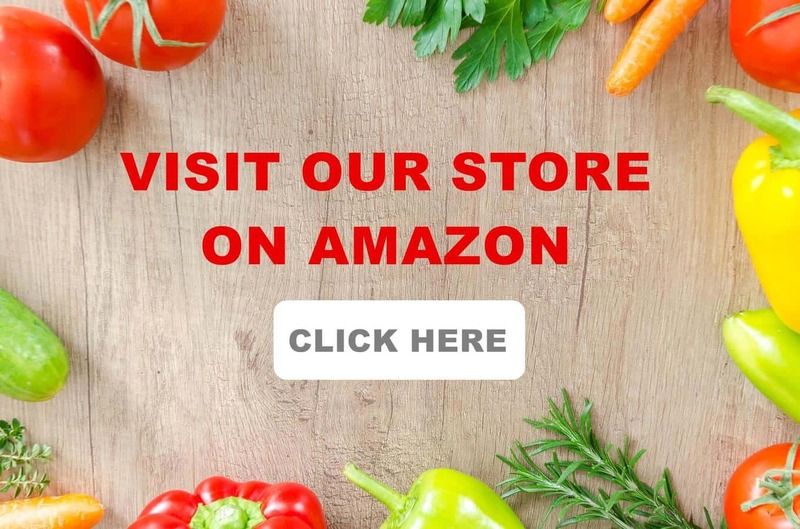 Here, you will find recipes for Authentic Mexican Chicken Tacos, a delicious Mole Shredded Chicken Casserole, a Shredded Chicken Mexican Salad, and many other recipes that use shredded chicken. That chicken could be cooked in your slow cooker, in an Instant Pot, or it could be rotisserie chicken. 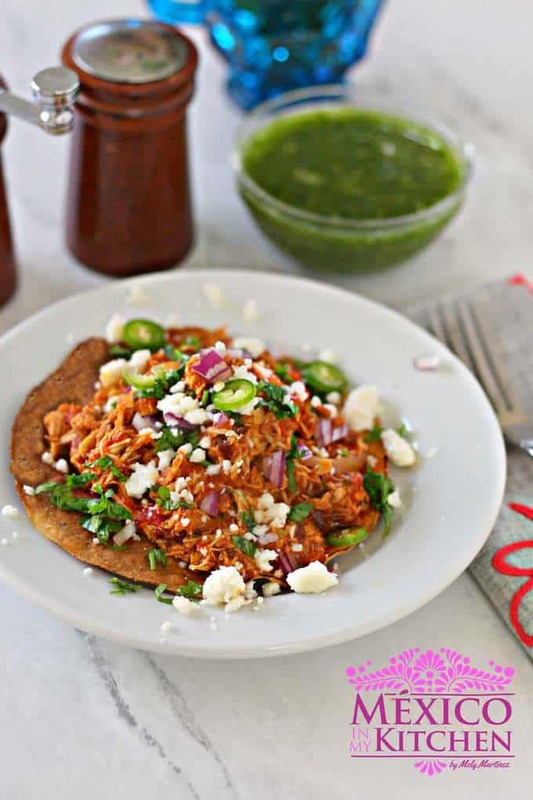 First, let’s start with one of the most popular shredded Chicken Mexican dishes: Chicken Tinga, a dish from the State of Puebla that can be used to make tacos, to top tostadas or sopes, and—my favorite—as a filling for empanadas. By the way, Starbucks even has a sandwich with this type of filling! A unique Shredded Chicken Tostada from the State of Nuevo Leon, served with another tostada on top. Make the special avocado spread, and you are good to go! There is a chain of restaurants in Monterrey, NL that serves these tostadas, and many people will also request a serving of the chicken broth for their meal. Next up is Mexican Shredded Chicken Salad, a classic salad for summer and a great option for children’s birthday parties. It’s perfect to take to potlucks, too! This shredded chicken salad is made with potatoes, carrots, and peas. Don’t forget to serve saltine crackers along with this salad! These leftover tacos can be made with other types of meat besides Shredded Chicken, but the idea of using a nice fresh topping (like cabbage) gives these tacos a whole different taste, regardless of the meat used. I hope you give them a try at least once, and not just with chicken, but also with all the suggestion given in that post. This finger-licking dish is a great way to use that leftover rotisserie chicken you bought at the grocery store. Follow the instructions to season the chicken to enhance its flavor. 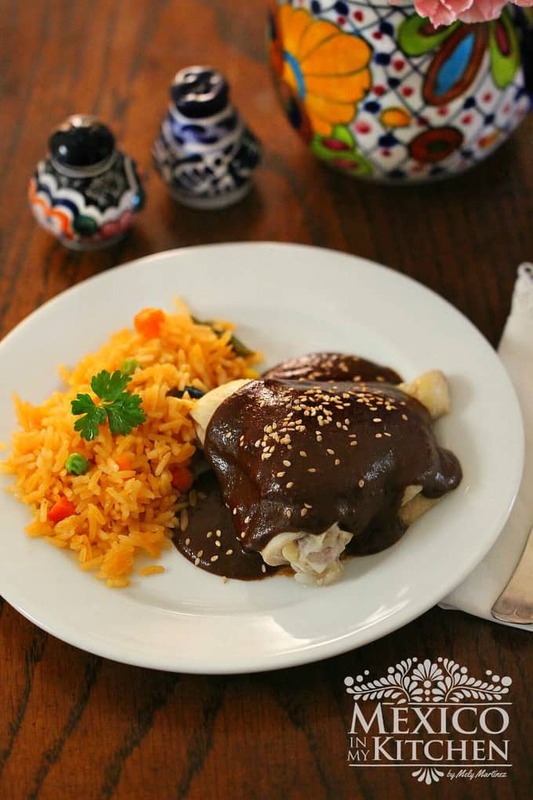 Store-bought Mole Poblano Paste is ok to use. This recipe uses almost the same ingredients as the “enmoladas” mentioned above, but the added bonus is that you can make this shredded chicken mole casserole ahead of time, and just pop it in the oven to warm and melt that gooey cheese on top. Believe me, it is amazing! So happy to have these recipes! You are welcome! I hope you enjoy cooking them. love your recipes,keep up the good work. I’m so excited to make enmoladas. I love mole but this casserole is a one-pot cooking. For the tamal de cazuela, do you add baking powder when preparing the masa as in making tamales? I don’t usually add it for the Tamal de Cazuela dough, but you are welcome to add it. Thanks. I am definitely going to try these. Wow, this looks so delicious. I love Chicken Tinga. Tacos de Leftovers might be a hit with the kids too! I hope you try some of these options.